Friday 3rd March saw BID Leicester team up with Leicestershire Business Voice (LBV) for a lunchtime event at Parcel Yard on London Road. 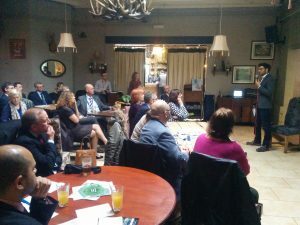 The event, which was attended by around 55 delegates, provided the business community with another opportunity to engage with the Steering Group and ask questions about the BID. Guests had the chance to hear from BID Leicester Co-chair Chris Stafford and a cross-sector panel of representatives from the Steering Group. Chris started off the presentation and his concentration was tested as hot food was being served to customers in the main bar and repeatedly being walked from the kitchen across the stage area; kudos to all speakers for not getting distracted! 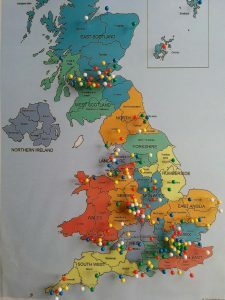 For the benefit of anyone that wasn’t familiar with BIDs Chris gave an explanation and outlined how widespread they are, with 216 currently running throughout the UK. Chris touched on the proposed BID area and projected fund (£3.35m over 5 years) and gave some examples of initiatives from other BIDs that we’ll summarise in an upcoming blog. Gary Rowntree, Head of Branch at John Lewis Highcross and our Retail Champion was next up and spoke about his positive experience from the BID in Nottingham, and notably how many smaller businesses below the levy threshold actually ended up voluntarily contributing as they wanted to be involved in BID initiatives and have a say. One of our representatives from the commercial sector Richard Osborn, Weightmans LLP, explained that they want to invest in the wider Leicester community and how they saw the BID as the ideal model to do this, where businesses come together to get things done and importantly get to say where they want the investment to be directed. Karl Craig-West then spoke from his perspective as a small business owner and FSB member. Karl’s support stems from his recognition of the benefits of the collective voice a BID can provide to the business community. Aatin Anadkat, owner of Maiyango Hotel and Restaurant spoke about the growth of Leicester’s evening economy and as an overnight destination. He highlighted the need to capitalise on the current momentum and push towards becoming a 2 night destination by ensuring structures and strategies are in place to build on the existing tourist offer. He emphasised BID Leicester was a cross-sector BID and that the benefits would be felt beyond the retail sector as the public now expect and seek out a more rounded experience when they visit the city centre. He stressed the BID would be well positioned to help bridge to daytime offer to the evening economy. Jed Spittle, who is leading the Haymarket Consortium in bringing the Haymarket Theatre back to life, spoke about his excitement of what the BID could bring to the city centre and how the transition to a more balanced retail/leisure offer sets the city centre apart from the alternative out of town or internet shopping experiences. The panel then answered a few questions from the floor before everyone got to tuck into our own lunch kindly sponsored by LBV. The general consensus seemed to be that the event went well and was actually a working example of what can happen when business people come together for a common interest. Once again, many thanks to LBV for hosting us and we’ll certainly be looking to follow-up with similar style events in the future to keep pushing the message of the BID and reaching businesses from all sectors. If you’d like the slides from Friday’s presentation or have any comments please contact us at info@bidleicester.co.uk or let us know your comments in the box below. BID LEICESTER is led by businesses for businesses and as a result is informed by consultation and feedback from the business community. The proposal will be based on your opinions and therefore information can change.